Poetry International (SDSU) carries a micro-review of The Knowledge on their website today. Lorenia Salgado notes “the speaker’s intricate response to life’s perplexing moments” throughout the book’s three sections, and quotes passages from “Nocturne with Writer’s Block” to illustrate various forms of Kafkaesque metamorphosis. Reflection. Defiance. Insects. What more could you want from poetry? You can read the full review at Poetry International. My three-year-old nephew brought the post to me this morning. He wanted to do it himself because the package was very heavy and, like all three-year-old boys, he wants everyone to know that he is very strong. 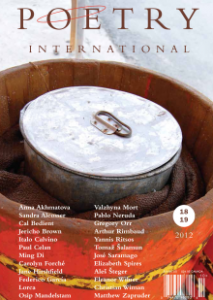 It was my contributor’s copy of Poetry International 18/19, all 736 pages of it, a treasure chest of poems and reviews. I am particularly enjoying the profile on Jane Hirshfield, whom I will be hosting for a Transatlantic Poetry on Air reading in August. My two book reviews begin on page 700. Fred Moramarco was longtime editor of Poetry International, and his The City of Eden collects a lifetime of work spent in the rich conversation of poetry. Jonathan Harris is a newer poet, contemporary with me at the Pacific University MFA, whose brave debut The Wave That Did Not Break is a duet between him and his poet mother, who committed suicide when he was eleven. The hefty double-issue also contains a review of Nikola Madzirov’s latest collection, exciting translations of Pablo Neruda, and many other gems. It will easily sustain me for another year. You can order copies directly from San Diego State University Press. But the upside of ignorance is an untainted first impression, and here is mine: that I found a poet unabashedly touching upon God with neither irony nor simple-mindedness, sounding out complex and compact verse with intoxicating musicality. Here, I thought, is a modern Gerard Manley Hopkins completely unafraid to strike his note. Here also, I thought, in fact, are the kind of poems I might one day write myself if I knew I did not have much more time to live. With this strange thought fresh in mind, I Googled Wiman, mostly to see if I could pre-order his third book, Every Riven Thing. Instead I discovered an article in The American Scholar, wherein he describes how falling in love and, soon after, being diagnosed with a terminal disease led him back to the fierce new kind of poetry now resting in my lap. I received my contributor’s copy of Poetry International (SDSU Press, 2010) yesterday afternoon. It is an excellent annual anthology of poetry, essays, and reviews from the U.S. and abroad. I am honored to have my short poem, “At the Zoo” appear alongside poems by living poet-heroes of mine such as Yehuda Amichai, Stephen Dunn, and David St. John. I plan to read this poem tomorrow night at the Carnegie Art Museum as part of my set. At the request of reviews editor Sarah Maclay, I also reviewed two books for this double-issue edition. Julia B. Levine’s Ditch Tender is voraciously associative in its exploration of the human condition. Robert Gibb’s World Over Water burns with the quiet intensity of the past. I am equally excited to discover new authors, books, and ideas about poetry through this 445-page literary tome. Like firewood stacked in the shed, there is fuel here to last all year, and I am grateful to have contributed my own small share of kindling to the mix.